Kasey Kahne at the Auto Club 400 weekend in California earlier this year. Monster Energy NASCAR Cup Series driver Kasey Kahne announced in August that he would retire from full-time NASCAR competition after this season, but he won’t finish the season after all. Just two weeks after that announcement, bizarre complications with heat exhaustion sidelined him indefinitely. 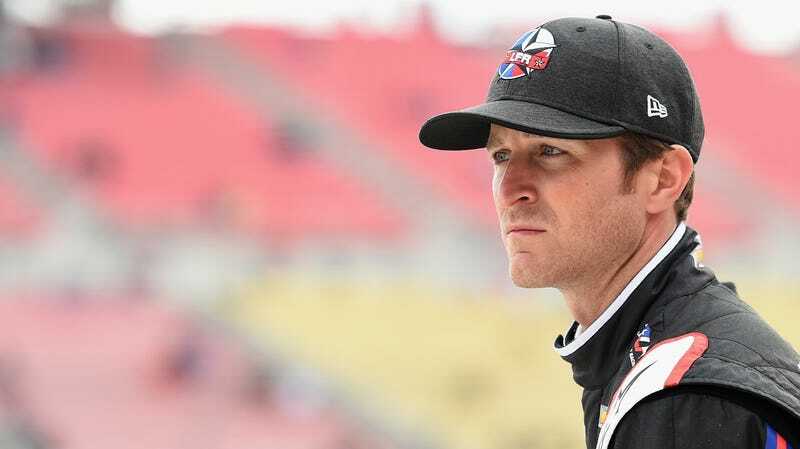 Kahne tweeted the retirement announcement Aug. 16, saying the “grueling” 36-race Cup Series schedule “takes a toll on your quality of life.” He said the highs didn’t outweigh the lows, that he wanted more time to be with his son and his sprint-car teams, but that he still had more work to do with his NASCAR team this year before leaving the series. But Kahne, who has 18-career wins in the Cup Series, will have a substitute in his No. 95 Leavine Family Racing car for the rest of the year instead. He posted on Twitter this week that he wouldn’t be back in the No. 95 car this year, after experiencing extreme heat exhaustion and dehydration after his last Cup Series race at Darlington Raceway in September that apparently hasn’t gotten better. Kahne hasn’t raced in the Cup Series since Darlington, other than driving laps for medical tests at Charlotte Motor Speedway to see if he’d be cleared to race again this season. He hoped “everything would go well [in the tests] and [he] would be able to finish out the season strong,” but it didn’t go well enough. Kahne said despite not finishing out the last six races of his final season in the Cup Series, he’ll be back on the dirt track in sprint cars soon. The shorter races and open cockpits, he said, don’t pose any threat to his health or hydration like the longer races in the Cup Series cars do. Kahne raced in the Cup Series for 14 full seasons before this year, according to Racing Reference, winning Rookie of the Year in his first full season in 2004. In 529 career starts, he has 18 wins, 93 top-five finishes and 27 poles.